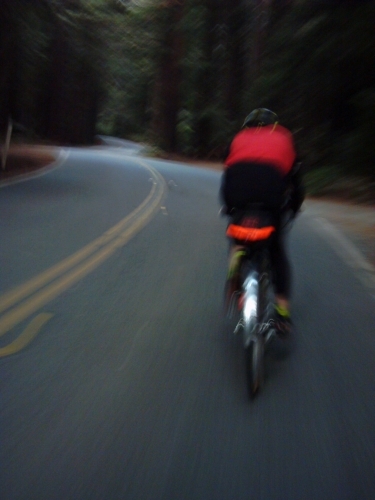 Wasn't sure if the body (mostly the left leg) would be up to the task, and I had not made arrangements to share a ride to the start of the SFR 200k Russian River brevet. This event was a little special as this weekend all over the country, clubs were organizing brevets to conmmemorate RUSA's 10th anniversary. I wanted to get the 10th anniversary medal for a top secret project/idea I have. Anyhow, the night before I made the decision that I was going to do the event, my usual short distance brevet "tank" was in pieces and its wheels where installed on the other bike, my Habanero MTB (mixed terrain bike, i guess) I prepare the clothes and gear and made sure the alarm was set correctly, twice. 6:04 I woke up, no alarm. oh s&#t with all that alarm setting I end up not enableing it! I told my half asleep wife that I was not gonna make it. She replied, "You are going, get ready and I will take you!" Yes sir I meam mom. At the start a lot of familiar faces came to say hi while I prepared my bike, Willie N., Veronica T., Rob H. and others were there. At 7:00 am Rob let us go. I would try to ride the event without pushing it. With our yearly bicycle touring vacation approaching I did not want to injure the left leg more than what it is. The weather was pleasant but a little cloudy. About 40 of us climbed up Lucas Valley Rd as a group. At the top Rob, who had climbed ahead was taking photos of all. I shot one of him but it did not turn out. JimG, my partner on so many rides, and I descended together. After that I pretty much sucked his wheel to Nicasio where he did a restroom stop. I kept going in the company of Alan L. and Bruce B. At the Cheese Factory on Point Reyes Petaluma Rd it was my turn to do a restroom stop. Alan kept going, and Bruce slowed a little to wait for Rob. By now JimG was there, I took off my long sleeve jersey and we were off. At the bottom of Willson hill I dropped the chain. JimG and Anthony, a rider we had been sharing some miles with, waited while I fixed it, then we rode. JimG and I arrived at the first control @ Valley Ford where many others where refueling on carbs, salts and other trade secrets. Once inside the store I could not find the V8 and wandered for a while. Then I saw Todd. I haven't seen Todd T. in a while so I went up to him and said hi. Finally, there it was, the V8, got it, filled up my bottle and was ready to go. JimG was still munching on something and it seemed he was going to be there a little longer so I let him know I was leaving. Right at the first turn after the control I had to stop and check the cue sheet. Good thing I did, I was going to go the wrong way. By the time I was ready to roll Todd T. and Gabe E. where there, I just followed them. Spent some miles with Todd and caught up a little on our conversation and then he slowed a little, Gabe and I continued. Gabe lead the way into the Bohemian Hwy, good thing he was in front otherwise I would probably had ended up doing some extra miles. After a while we separated and then I heard voices behind me. By the time we were leaving, others had arrived, we moved on hwy 121 behind Zach and then continued on Hwy 1 to Bodega Bay, the next control just a short distance away. We all went in to get a receipt and some food.I forgot to get a recipt for my bagel turkey dog (not good) so I had to go back in and buy some candy to get one. Charlie J. was fixing a broken chain and to me it seemed he was having trouble connecting some links so I pulled out some extra chain links that I carry and offered them, but his chain was 8 speed my links 9 speed. He said he would be fine. 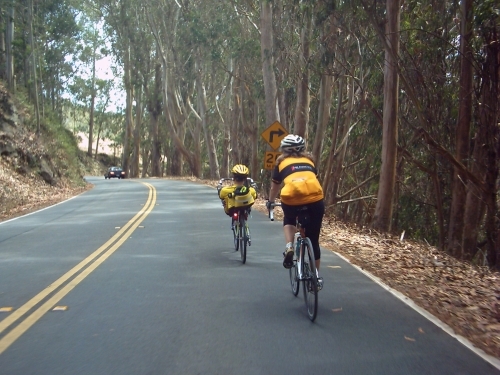 The rollers ahead where a little hard for me, by Tomales I was tired so I told Veronica that I would slow down a little. I think Zach heard that and gracefuly slowed the pace a bit and I was able to keep up with them to about a mile from the Marshall Store. Ah it was a glorious day at Marshall and the benches/tables outside made it the perfect spot to waste brevet minutes. I got a small bowl of chili (very good), refueled my Gatorade and went outside to find me a place to sit. Alex P. was there. Veronica and Zach shared a table with some tourist and I believed they even ofered us tired riders some oysters that they did not finish. After the food and rest I was not ready to go but it was time to move. When I came out from the restroom they were waiting for me. I pretty much rode in the back all the way to Lucas Valley Rd, just miles from the finish. By then my energy was coming back. Veronica and Zach had been chatting and that made the time go by fast. We got to the final control @ 3:26pm. 9:26 hours after we had started. We exchanged hand shakes with Veronica and Zach and I thanked them for dragging me all day. Without them my day would have been so much different. Greg B. was there volunteering. It was now time to exchange stories with others. Greg offered me a ride back to San Francisco if I would wait until the end of his shift, I accepted. More familiar faces rolled in. I shot photos of many but not all of them turned out. Phil M. and Mike B. who had done the previous day Santa Cruz 200k arrived and that triggered the cleanup. We helped Mark B., who had ridden and was now volunteering, pack things in his car. We all left at the same time and went home. Another great SFR event.